Marvel is building towards Avengers: Infinity War by slowly introducing the Infinity Stones, weapons of immense power created by ancient Celestial beings. To date, Marvel has revealed four of the six Infinity Stones and fans have long suspected that a fifth Stone will appear in the upcoming Doctor Strange movie. 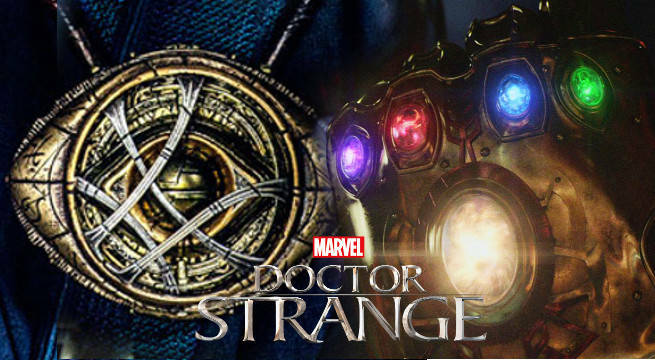 While discussing the creation of the Eye of Agamotto at a visit to the Doctor Strange set, prop master Barry Gibbs casually dropped that the mystical amulet holds an object that suspiciously looks like an Infinity Stone. Gibbs was discussing the challenges of creating props that can hold up to both practical and digital effects. He mentioned that the Eye of Agamotto opened up to reveal a small stone inside. "I've got a board laid out with how many stones we went through," Gibbs said, referring to the different design possibilities for the stone. "I think there was something like 24 color variations of the stone." Gibbs noted that part of the challenge was finding a stone design that fit inside the Eye. At one point, Gibbs had decided on using a different style of stone due to the large size of the Eye. "When [the Eye] opened, it was supposed to be an natural stone," he said. Instead, Gibbs and his team opted to make a "key piece", a prop that stands in for visual effects of some kind. Gibbs' version of the stone had a "pale green" color, but could look totally different in the final film depending on how visual effects portrays the stone. Gibbs didn't give any other details on the stone inside the Eye of Agamotto, but it's likely the Time Stone, one of the two Stones not yet seen in the Marvel Cinematic Universe. According to past interviews with Kevin Feige, Strange can use the Eye of Agamotto to manipulate time. The other missing Infinity Stone is the Soul Stone, which collects and imprisions souls. Doctor Strange comes out November 4 in the United States.